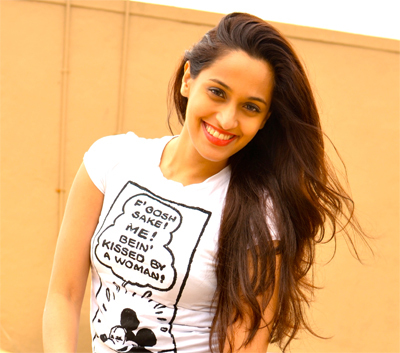 Known in Bollywood and the South film industries, Shweta Pandit has sung some of the best songs and with the best singers in India. Not only that, Shweta performs with AR Rahman and most recently released her first English language song. A highly sought after playback singer, Shweta lent her beautiful voice for one of the songs for Bejoy Nambiar’s David, which opens on February 1st. However, here is something really cool about the film, we will also see Shweta in a new avatar for the film – that of actress. Shweta has taken on a challenging role in one of the three stories that makes up the world David. The film revolves around the lives of 3 Davids in 3 different parts of the world in 3 different eras. Shweta’s story is set in 1999 Mumbai and she plays, well… let’s let her tell you about that. Read on to see what Shweta revealed about her first acting role, working with Bejoy, what her David is all about and more! Is David your first acting role? It is! I am really excited because David is probably the best way I could have thought of getting into acting. It has got a fantastic director Bejoy Nambiar. This is his second film (Shaitan) and you know he is brilliant. He’s phenomenal. He can surprise you. He can do so many things, which will completely blow your mind when you are actually watching the movie onscreen. Tell us about how the role in David came about. To actually have Bejoy Nambiar approach me for a role was pretty, pretty incredible. Bejoy had heard my music because he hears a lot of music in the South, a lot of Tamil songs and a lot of Telegu songs. My sounds are pretty popular down South and he had heard a lot of them. When I met him he said you know I really like your voice and I am going to make you sing in my film. So when he called me, I thought he called me to sing in his film. I was really excited that a director wants to meet me! So I get there and he says, ‘So, tell me do you want to act in my film?’ I actually thought he was kidding because he can be like that he could joke around. I didn’t take him seriously. I was like yeah, yeah, yeah… Oh my God I would love to act in your film. Honestly, I was completely not taking him seriously. Now, I had shot a music video with him when he was making his first film. So he knew how I looked on camera and I think that he thought that maybe I could be a part of his next film because of that video. So then, as I said, we met and he was serious about me playing a role in David. He told me there is this character Alice in David. It is a small role. There are dozens of very fine actors in the film and it will be interesting for you to try something like this. He told me it has an amazing cast including Lara Dutta, Tabu, Isha Sharvani Neil Nitin Mukesh, Vikram sir, and Vinay Virmani. My story in David is primarily about this really poor family in Mumbai. I am the daughter of the priest. Our part of the film is basically the priest and David and their interaction. It is also about this family that we are all apart of, which gets into major trouble. What the trouble is and what they get into you will have to see in the film. Alice is a teenager, a tomboy, she is brash, a little spoiled, she’s funny and she is the apple of her dad’s eye. She’s a lovely young girl who sings as well. They are like any other family in a city like Mumbai, but they go through something, which is hell. This whole family is trying to stand up for each other and fight against this thing that comes their way. It is about how everything changes for them because they go from a very, very fun loving family and then the film suddenly takes a turn and everything becomes really serious in their lives. So you will see me like a really fun loving girl in the start of the film and suddenly I get into a really emotional journey. That’s pretty much what Alice is about. You didn’t go easy for your first role, she seems as if it was a difficult role to play. So how did you get into the character? Yes, it was quite a challenge to get into this character because we were actually shooting in real slums, shooting in real rain to get the whole thing feeling really real. We were shooting in sync sound too see, so yes, it was quite a challenge. And I was shooting this film in two languages in Hindi and in Tamil so that was another challenge. I am there in both versions of the film. It is interesting that I could experience something like this apart for my musical career. It is like you seep up knowledge from everywhere because when you’re working on a movie and people working towards completing a movie it’s amazing. The energy is amazing. You are learning so much. One of the reasons I really wanted to work on this film was to get so much out of it. I was working with Lara Dutta, Vinay Virmani, whose playing David in the Hindi version. You have some of the finest actors; you have a very strong and interesting story. You have Neil’s story of the gangster, which is shot completely in black and white. Then there is Chiyaan Vikram, who is probably one of the greatest superstars of India. When I came to know he is in the movie that is one of the main reasons I wanted to be a part of the film because he is such a fantastic actor. Then there is Nassar sir who’s a veteran South actor. He has done a lot of films in Bombay as well, he as done Rowdy Rathore and he has done a lot of other films. He plays my father in the film. To be with him and to understand comic timing, understand seriousness on screen there’s so much to learn, which I wouldn’t have learned otherwise. I mean if I was out there trying very hard to audition for roles and trying to be an actor it would just probably take away my music career. See, I didn’t want to try to hard like oh my God I need a really big role. I need to be this launch girl and she is like all over hoardings and everything. That is not what I wanted. This film is primarily about the guys, but at the same time it gives me a good scope for performance. It gives me a good scope to learn and also be in the presence of some fantastic actors in the same frame and observing cinema closely. I thought at this stage in my life it was a good decision to be a part of this film and work with Bejoy. I had a great time working on this film. I really think it is going to be special. The crew was amazing – we had the best cameraman, the best technicians – it was amazing. I really am excited that David is going to come out. Now you said you are a singer in the film, do you lip synch to your own song? I actually have sung the song to Isha Sharvani. (Laughs) Bejoy kept his promise of making me sing in the film and give me a role in the film, which is amazing. Isha is a very pretty girl so it is always fun to sing for pretty girls. (Laughs) My song is shot on Vikram sir and Isha so I was doubly excited about that because I get to be a part of his story as well. Bejoy has got an amazing ear for music. He has picked up some really rare choices. He has brought in a lot of new talent on board, which is amazing. I think very few directors give you the right kind of break. What did you take away with you as person, as a singer and as an actress from this film? All of last year was primarily dedicated to David. I learnt so much. There were workshops. There were a lot of things I learned while I was studying on the film, on my role and also other people’s roles. To even sit and observe other actors and see how a film is made and how they bring it from paper to screen it was so different. Also technically it was a very brilliant experience. Being a part of it parallel-ly as a singer and an actress it was just amazing! Has the acting bug hit you? Will we see you in more films? (Laughs) Yeah, I would love too! I would love to work with some fantastic directors. I would love to see what I can do next. I haven’t instantly jumped on something. David was shot just four months back, so I am really amazed that it is releasing in Feb and it is all happening so quickly. I actually really haven’t gotten the chance to go out and tell people okay guys I am acting. So it has not really given me that chance yet. I am hoping when the films comes out people will I can probably do much more. David hits theaters on February 1st! 17 queries in 0.948 seconds.